Eating out or staying in a hotel can be a challenge with dairy free kids. Quite often we realise that there is no dessert option and leave early to avoid the potential tantrum, or one of us nips out to buy sweets to give to the child as dessert. I have often travelled to a hotel with several 200ml cartons of alpro soya milk and brought one down each morning for cereal or to fill a bottle. Twice lately I have been in hotels where soya milk was on the table with the other milks and there was no needing to ask or bring down our own. I will update this as I get more information on restaurants and hotels. Please e-mail or comment to help me add to this. The Kitchen in Gorey have a soya milk option on their tea and coffee menu and gluten free sauces and soups on their dinner menu.We brought the kids there for lunch and the lunch menu has plenty of dairy free options. Unfortunately there was no dairy free dessert but the chef offered to do up a fruit salad. It is child friendly, my boys were given colouring pencils and colouring books and they do have a baby changing unit, but you need to ask as it is located away from the other bathrooms. Eco in Gorey have many dairy free options on their starters and main courses, and will make any pizza without cheese. You can look at their kids menu here. Kids options are spaghetti bolognese, pasta with tomato sauce, plain pasta, and sausages, goujons or hamburger with chips. The only non dairy kids option is the spaghetti carbonara. However they offer ice cream and milkshakes as the only dessert options for kids. On asking they could offer a fruit salad but that is the only dairy free dessert available. They don’t have any dairy free options for tea and coffee either. In terms of bringing kids to lunch there, it is very handy as if you get a booth you can ‘lock’ the kids in the inside so they can’t run around the restaurant. Staff are very friendly and patient and good with kids. 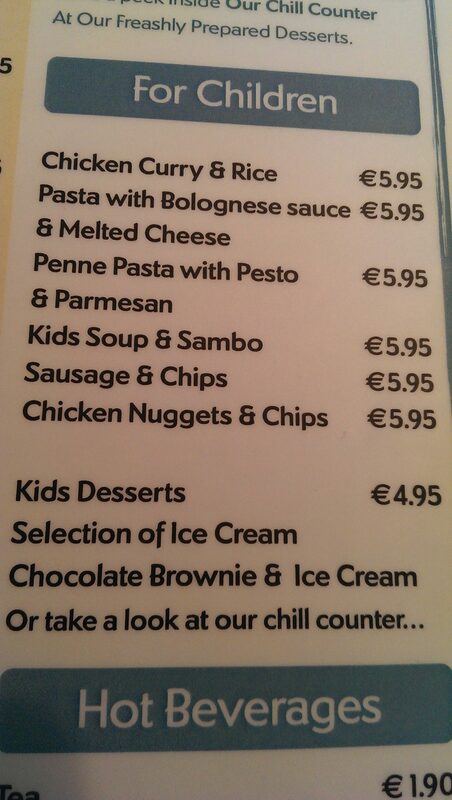 Partridges Bistro in Gorey have a kids special menu, it includes a main course, brownie and a kids’ fun pack. Two out of three main courses are dairy free, pasta bolognese or sausage and chips, but there is no dairy-free alternative to the chocolate brownie which is disappointing. They also offer soya milk for teas and coffees here. The dairy free options, were the spag bol without cheese and the sausage or nuggets with chips. It was also possible to order a half main course from the adults menu, I enquired about the roast beef special but unfortunately the potatoes had been premixed with butter. My dairy free darling had some of the vegetables that were roasted in oil, chips and nuggets and some of Daddy’s roast beef. The staff were very on the ball and were very willing to double check dairy content with the chef. The desserts as above were of course containing dairy but they had no issue giving my son a bowl of fresh strawberries, he was delighted and gobbled them and demanded more, which they were very obliging about. All in all a great experience to eat there with the kids. Gleneagle Hotel Killarney – Alpro Soya original beside the fresh cows milk and low fat cows milk options at the breakfast buffet. Osprey Hotel Naas – Soya Milk and Gluten free bread both part of their standard breakfast buffet. The Hodson Bay hotel in Athlone do not have any milk alternatives available at breakfast. Check out Dublin with food allergies, which has excellent listings for free from restaurants in Dublin. Re the Kitchen in Gorey … We had lunch there today . I was most impressed. I imagine that they would go the extra mile, if one wanted dairy free. The staff were very attentive . There was a great atmosphere, a good crowd and fantastic food . I had Clodagh Mc Kenna’s roast butternut squash, feta, roasted pumkinseeds and rocket salad with an orange dressing . Absolutely delicious . My friend had a Thai green curry . He was also very happy . We will be returning !